Andrew Jackson, b. 1814 Narrative and Writings of Andrew Jackson, of Kentucky; Containing an Account of His Birth, and Twenty-Six Years of His Life While a Slave; His Escape; Five Years of Freedom, Together with Anecdotes Relating to Slavery; Journal of One Year's Travels; Sketches, etc. Narrated by Himself; Written by a Friend. 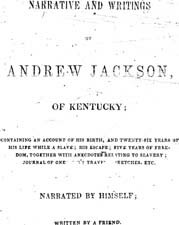 Narrative and Writings of Andrew Jackson, of Kentucky; Containing an Account of His Birth, and Twenty-Six Years of His Life While a Slave; His Escape; Five Years of Freedom, Together with Anecdotes Relating to Slavery; Journal of One Year's Travels; Sketches, etc. Narrated by Himself; Written by a Friend. African American abolitonists -- Biography.